ST. LOUIS (AP) — Milwaukee’s last NL MVP thinks he is about to get some company. Led by Christian Yelich’s silky smooth game, the Brewers are closing in on the playoffs. 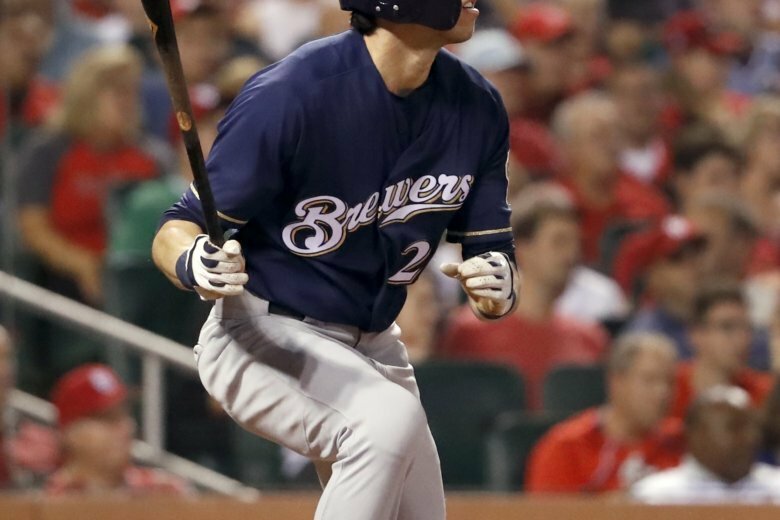 Yelich homered and drove in a career-high six runs, and surging Milwaukee hurt St. Louis’ postseason chances with a 12-4 victory over the Cardinals on Tuesday. Ryan Braun went deep twice and Jesus Aguilar also connected as Milwaukee lowered its magic number for clinching a playoff spot to one. But the Brewers are thinking bigger after their fifth win in six games put them just a half-game back of the NL Central-leading Chicago Cubs. Milwaukee (91-67) leads Colorado by 3½ games for the top wild card. St. Louis (87-71) dropped a half-game behind Colorado for the second NL wild card after the Rockies routed Philadelphia 10-3. Following Wednesday’s series finale, Milwaukee closes the regular season with a weekend set at home against lowly Detroit. St. Louis also is off Thursday before beginning a three-game series against the slumping Cubs at Wrigley Field. Yadier Molina hit a three-run homer for the Cardinals, who had won six of seven before their 6-4 loss to Milwaukee on Monday night. Marcell Ozuna went 3 for 3 with a walk. St. Louis left the bases loaded in the fifth and seventh innings when Jedd Gyorko came up empty each time. Third baseman Mike Moustakas turned an inning-ending double play on Gyorko’s chopper near the bag in the fifth, and Gyorko flied to right for the final out of the seventh. Milwaukee scored 11 runs with two out, including its first six. Yelich came up with the bases loaded in the fourth and tripled into the gap in right-center, lifting the Brewers to a 6-0 lead. After Lorenzo Cain was intentionally walked with two out in the ninth, Yelich hit a three-run drive to center. Yelich is batting .346 with seven homers and 28 RBIs in 22 games this month. He has 33 homers, 104 RBIs, 110 runs and 181 hits on the year, all career highs. Braun, who won the MVP award in 2011, said he thinks Yelich is about to join the club. Taylor Williams (1-3), the second of six Milwaukee relievers after Gio Gonzalez pitched four innings, got three outs for the win. The Brewers used nine pitchers in their series-opening victory. Cardinals rookie Austin Gomber (6-2) was tagged for five runs and seven hits in 3 2/3 innings. Cardinals first baseman Matt Carpenter and Shildt were ejected in the seventh inning. Carpenter argued with home plate umpire Will Little after he was called out on strikes, and then was thrown out as he walked toward the dugout. Brewers: All-Star reliever Jeremy Jeffress was available after he missed the series opener because of neck spasms. Brewers right-hander Jhoulys Chacin (14-8, 3.61 ERA) and Cardinals right-hander John Gant (7-6, 3.53 ERA) pitch Wednesday night in the series finale. Chacin is 0-3 with a 4.34 ERA in four September starts. Gant lasted just 2 2/3 innings in his last outing, yielding one run and four hits Friday against the Giants.